Most would agree that truly rewarding partnerships are built on friendship. 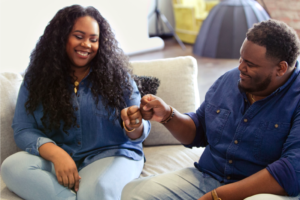 Sitting with Jamie and Dontez Heard in the sunlit studio where the couple lives and works, it’s abundantly clear that a deep friendship is the bedrock of their relationship. The stylist and photographer are the team behind Ästhetik, a collaborative creative venture set to open this spring offering event and studio space as well as a design lab and printing services. The CO.STARTERS graduates and husband and wife opened up about growing their business and their family. Dontez: We both went to UAB, and we would always see each other in the business building. At the time, I was studying marketing and Jamie was majoring in accounting. We had mutual friends and attended the same church but didn’t actually know each other. Jamie: I noticed him at church because he was always coming in late and sitting in the front row. There was something about his face, and I felt that I would somehow end up knowing him. We were finally introduced by some mutual friends one day and we all decided to meet up that evening. I went home first to change my outfit. So, you’ve always had a penchant for style? Jamie: Yes! When I was a little girl, I always loved getting a new outfit for every holiday. My mother would give me some money to get a new dress for myself and then tell me to pick out something for her too. She really fostered my creativity and interest in fashion. Later, in college, I was always asked by girlfriends to dress them for parties and trips. I loved making others feel good about themselves, but I never considered it a viable career option until Dontez encouraged me to pursue it. Dontez, how did you jump from marketing to photography and graphic design? Dontez: I’ve always had a deep love for music. I play the piano and some other instruments. I began producing some singer/songwriters. I didn’t have the resources to outsource anything, so I learned how to shoot video and use a camera. I began to do some graphic design and really just learned through trial and error. Then, in college, I landed an internship in the then Mayor Bell’s office where I did a lot of design work. That opened up opportunities in networking with organizations. I developed a passion for photography, and I began to build a portfolio of work from the relationships I built during my time in the mayor’s office. What was the catalyst for you two to team up professionally and what is it like to work with your spouse? Jamie: For me, the lightbulb went off on a road trip to Mobile. We had a lot of time to talk and dream about the future. Dontez asked me what I would choose to do if money weren’t a part of the equation. I told him how I felt about styling and he became my greatest cheerleader. At that time, I didn’t have any clients, so he would photograph me or my friends who I had styled. 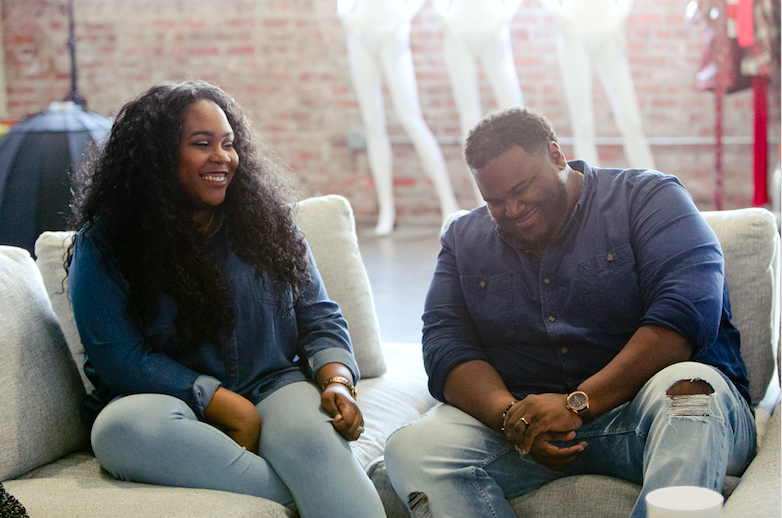 We love collaborating, and we compliment each other. Dontez continues to inspire me. He has such faith in himself, and a bravery that doesn’t come naturally to me. When he decided that he was going to leave the mayor’s office to pursue photography full time, I was hesitant. I thought that he should let it be a side hustle until he had more clients, but he made a leap of faith. He struggled for the first couple of years, but he never let that deter him. Watching all his hard work yield the level of success he has achieved makes me so proud and motivates me to take risks and believe in myself. Dontez: I believe in her. Jamie makes me better in every way; she sharpens me and is consistently pushing me to raise the bar. We have experienced hardships together. We both lost parents to lung cancer within a year of each other. That was an intense grieving process. We were lucky to have discovered our creativity and passion together, but to experience loss in the same exact way strengthened our bond. We were able to support each other in a way that forced us to grow and build each other up. What does the year ahead hold for you as a couple and colleagues? Jamie: We are so excited to be expanding our business and creating a space for creative community. We live and work out of our current studio, and we want to make our home life feel more private. We are also wanting to expand our family this year, so making space for a baby is a priority. Pregnancy has been another personal struggle for us, but we are hopeful and committed to taking on any challenge together. Dontez: We are building our new studio in the old Feast & Forest space. We definitely have a lot going on, and we are always learning and growing. But, we have only good problems.